This month SCOLA followers traveled to Iran with SCOLA provider Somayeh. Somayeh is from Iran, originally Tehran. She is currently a second year graduate student in French Language and Translation Studies. Her thesis is about the role of the translator as a researcher in the process of translation. Somayeh also currently teaches French at Language Institutes. Somayeh loves teaching in general, but especially enjoys teaching languages. Have you enjoyed the material Somayeh sent in for our December Country of the Month? Then be sure to check out Savoir-Vivre, coming soon to SCOLA for more material from Somayeh! I’ll give Samarkand & Bukhara, for her Hindu beauty mole. By running brooks, in flowery fields, spend your days and stroll. Took the patience of my heart, like looting Turks take their toll. For the Perfect Beauty, frills and adornments play no role. Even the chaste Mistress succumbed to the love she would extol. Sweetness of tongue and the lips, even bitterness would enthrall. The fortunate blessed youth, listen to the old wise soul. None has found and no-one will, knowledge leaves this riddle whole. Venus wedded to your songs, in the firmaments’ inverted bowl. Want to learn more about literature in other cultures around the world? Watch for the release of Savoir-Vivre and then visit www.scola.org for your free trial! Frohe Weihnachten! This week I am going to visit Germany with On the Street Videos, but you had probably already guessed that from my holiday greeting! SCOLA has over 2,500 authentic resources that include audio, images, text, and video, so I’m easily able to learn all about this new destination before I begin my adventure. My first task before I begin my adventure is to log on to Insta-Class on www.scola.org and brush up on my German. The service has ready to use lessons in four different skill levels: beginner, intermediate, superior, and advanced. I start a beginner lesson with a video clip taken at a zoo in Germany. I’m able to read the transcript and translation, take a quiz about the clip, study vocabulary, and then discuss the lesson with other Insta-Class users on a forum. I breeze through a couple beginner lessons and make my way up to the advanced level. Once I am feeling confident in my German skills I venture over to another SCOLA service- Spoken Word. Spoken Word is an audio and video forum that allows me to bypass time zones and avoid long distance phone charges by chatting with a native speaker from the comfort of my own home! I log on and leave a video message for Marianne, the German native speaker, and receive a response back within 24 hours! Spoken Word is a great tool for help with pronunciation, and it allows you to pick up on nonverbal communication within the culture. With the help of Insta-Class and Marianne I feel prepared to begin my travels with On the Street Videos! 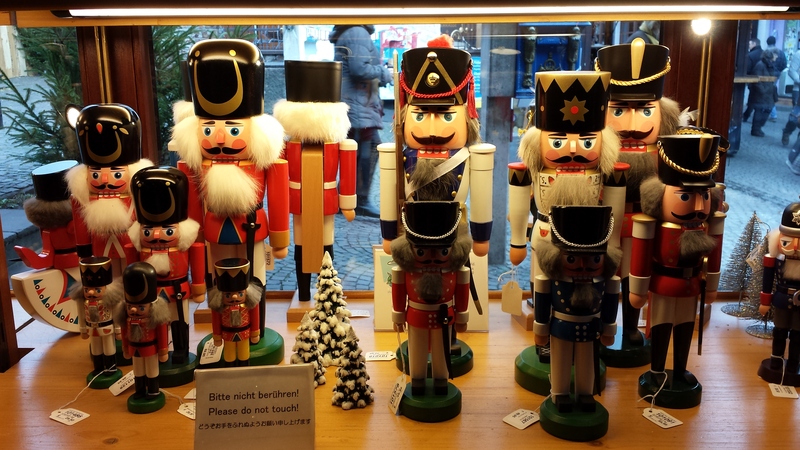 With the Christmas holiday quickly approaching, my first stop in Germany is to learn about how the holiday is celebrated in Germany. I am able to chat with a local woman who shows me some traditional Christmas mangers and explains other holiday decorations. My second stop is a local sports club in Germany. I am able to chat with the sports club president, and explore the facilities. The president explains to me what different indoor and outdoor areas of the club are used for. The last stop on my journey with On the Street Videos is to experience professional motor sports in Germany! I am able to talk with different professionals and explore the world of motor sports: different vehicles, the way different parts work, and so much more! I can’t wait to come back to Germany and learn more about this topic, but for now, there is so much more in the world I need to explore! From a birthday party in Peru to professional motor sports in Germany, I never know where my adventures with On the Street Videos will lead me! Join me in my adventures with your free trial at www.scola.org! Check back soon to see where my travels take me next! One of the great things about traveling with On the Street Videos is that it allows me to travel safely to places I might not otherwise be able to. For example, this week I am traveling to Syria, a place often featured in the news because of unrest in the country. Curious about the country’s current state, I first log on to Foreign Text. I’m able to learn about current events and Syria’s culture while browsing recurring newspapers and magazines, and practice my Arabic while leafing through the collection of Syrian books. I’ve been awfully busy with finals and the end of the school year coming up, but International Radio on SCOLA Mobile Apps allows me to listen to over 300 radio broadcasts from Syria so I can keep learning about my destination while also focusing on schoolwork. Soon, I am ready to begin my next international adventure! I log on to On the Street Videos to begin my travels to Syria. My first stop is the Syrian border, where I am able to chat with locals, and visit residences in the area. Next, I am able to talk with Syrian refugees and learn what living in Syria was like. My next stop is to see Syria from a different point of view. I visit an elementary school, where I am able to sit in on an education lesson with students, and see what the education system is like for children living in Syria. My last stop in Syria is to meet with a young couple and experience what life is like for newlyweds in Syria. The couple tells me at what age people in Syria typically marry, how the engagement and wedding are arranged, and what customs and traditions they have. They tell me about traditions of the old days, then we discuss more modern traditions, the costs of the wedding, and the dowry in Islam. I thank the couple for their time and teaching me about their wonderful country of Syria, and in a matter of seconds I am back home on my couch, finishing homework and studying for finals…. Join me on my adventure by visiting www.scola.org and accessing your free trial! Want to tell us about your favorite holiday? Comment below! Learn more about holidays around the world on Savoir-Vivre, coming soon to SCOLA! If you can think back that far, you will remember that thirteen weeks ago I began my travels with SCOLA with Peru as my first destination. In that time I have traveled to countries around the world and learned a lot about different cultures and languages, so it is no surprise that I feel like I need to brush up on my Spanish! I decide to journey back to South America and visit Argentina. Before I do though, I better refresh my Spanish skills! I first log on to Insta-Class to review ready-to-use Spanish lessons from Argentina. I start out with Beginner Lessons, and the language quickly comes back to me as I work my way up to the Advanced Lessons. I’m anxious to start my journey, but before I do there is one more stop I have to make on SCOLA.org– World TV Online of course! Did you know that Channel Two plays various programs from Argentina every weekday? It is a great resource for learning the Spanish language and learning about current, local events in Argentina. Once the program is over I am ready to begin my international adventure! I log on to On the Street Videos to start my journey in Argentina. All of this learning and traveling has made me work up an appetite, so the first stop is to learn how to prepare a traditional Argentinean torte! Delicious! I now have the energy to continue my travels through this beautiful country. My next stop is a rodeo show, which makes me so happy I took the time to refresh my Spanish skills. Without learning Spanish with SCOLA I wouldn’t have been able to understand any of the jokes or entertainment at the rodeo. The rodeo was great fun, but my next adventure here in Argentina takes me to something a little more serious- a First Communion ceremony at a church here in Argentina. The ceremony was beautiful and the perfect way to end my second tour of South America. Visit SCOLA for your free trial of On the Street Videos and don’t forget to check back soon to see where I travel to next!